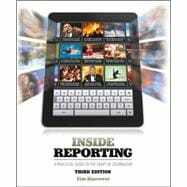 No other textbook offers a more engaging and accessible approach to newswriting than Inside Reporting. While emphasizing the basics, this new edition offers a wealth of information on digital reporting and packaging stories in modern, interactive ways. It also includes more useful advice on feature writingfrom stories to reviews and column-writingthan any other textbook in the field.